Once you purchase TrustedSite, you'll see it on the Domains Settings page in your GoDaddy account, where you can add it to your website. Required: If you already have an SSL Certificate for a domain you own with us, you must use the McAfee Secure Seal that comes with it instead of the TrustedSite Trustmark. Click a domain name on the list to go to its Domain Settings page. If your website is hosted with GoDaddy, you'll be able to seamlessly add the TrustedSite Trustmark. Click the Add TrustedSite Trustmark button. Your site will now be protected! 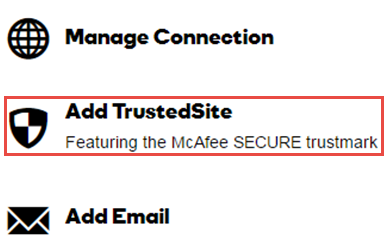 The McAfee secure trustmark will appear in the lower right-hand side of your website. If your website is not hosted with GoDaddy, you'll need to add the code to every page of your site to display the floating trustmark. It's recommended that you add the code before the closing body tag in your footer template file. If you experience any issues, please contact support at your hosting company for assistance. Note: It can take up to 24 hours for the Trustmark to publish to your site.